“Who Looks Inside, Awakens”: How I Embraced Big Changes in Life — Ai Addyson-Zhang, Ph.D. Recently, I had the great honor to be on Deirdre Breakenridge’s podcast, Women WorldWide. I have been a loyal listener of Deirdre’s podcast for quite a few years. So, it was a surreal moment to be a guest on her show. During our interview, I shared my journey of reinventing myself and how I expanded my professional services from teaching college-level public relations and social media courses to becoming a speaker, consultant, blogger, and live streamer. I had such a great time chatting with Deirdre; and we had an extensive and thought-provoking discussion. You can click on the link below and listen to the entire interview. In this article, I highlighted a few of my responses from Deirdre’s interview questions. Deirdre is the woman behind the WomenWorldWide podcast. As an author, speaker, educator, and CEO of Pure Performance Communications, Deirdre has been coaching and mentoring women and professionals in business for more than twenty years. She launched the Women WorldWide podcast to share women’s stories across the globe and highlight their successes and failures. I highly recommend that you subscribe to Deirdre’s Women WorldWide podcast and learn from the wisdom that these successful women leaders have shared. Now, let’s dive into my story. February 2017 was a challenging month. As a family, we collectively made the toughest decision that literally changed our lives. We decided to relocate from Philadelphia to Seoul, South Korea, for a few years due to my husband’s job. It was a decision made not without tears and struggles, knowing that this relocation was probably going to affect my career the most, as a college professor with a stable and secure job. A few months later, on April 8, 2017, we packed 10 suitcases of stuff, on top of the 820 pounds we already shipped to Korea, and boarded a plane to Seoul. A new chapter in my life had begun. Today, I have successfully added several titles to my Website and LinkedInpage, including speaker, consultant, blogger, and live streamer. 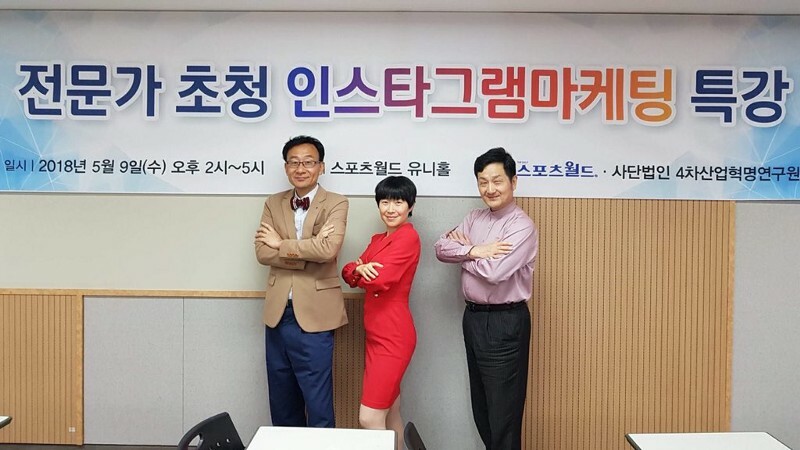 In fact, a few weeks ago, I did my first paid speaking engagement in Seoul with two local social media influencers, where we discussed Instagram marketing. Our event was covered in the Korean media, which totally made my day. In a few weeks, I will be doing my second paid speaking engagement at Hongik University’s School of Advertising and Public Relations. I will be discussing personal branding with Korean students. I have fallen in love with the person that I have become as a result of the self-reinvention. How Did I Embrace Change? I believe that I manifested the South Korea opportunity through my husband. From September 2017 to May 2018, I was on a research sabbatical. I spent lots of time conducting academic research, but I also spent an amount of time reading books and listening to podcasts on social media and self-development. It was the first time that I dove into concepts such as lifestyle businesses, entrepreneurship, digital CEOs, nomads, and online businesses. There was a desire in my heart that was craving for a bigger stage and some change. The desire grew stronger as I continued to learn and improve myself, and finally my desire was manifested through my husband’s opportunity to come to Korea. What I learned from reinventing myself is that, throughout our education and schooling, we invest so much time and energy in studying other people’s lives and works, but hardly any time in discovering our intrinsic values and getting to know ourselves. For the first time ever, I was looking inside, and I became aware of my own dreams and values. I am proud of myself for having the courage to embrace big changes in life and for taking the action to actualize my dreams. What is the State of Digital Learning? Technological advancement has disrupted quite a few industries such as taxi and hotel businesses. The same thing is happening in the education space. There are an ever-increasing number of alternative learning platforms that allow students to learn at any time and place that they want, such as Kahn Academy, Udemy, CreativeLive, MissionU, Massive Online Open Courses, and so many others. Organizations, influencers, and thought leaders from various industries are also launching their own online courses, certifications, training, etc. These alternative channels are gaining both popularity and credibility. At the same time, today’s students have changed dramatically. They grew up with technology and digital media devices. Contemporary students are digital learners. They prefer digital first and they love self-paced learning. As educators, we need to meet students where they are instead of expecting students to come to meet where we are, and learn to speak students’ language, the digital and the social media language. That’s why I am a huge advocate of incorporating digital media devices into classes as a teaching tool, and I do what I do as a Digital Learning Consultant. I am aware that there is a strong voice against using media devices in the classroom because they cause distractions. I agree that technologies are very distracting. However, I do believe that banning technology completely in our classrooms is not the way to solve the problem. Technology is not the root of the problem. Pedagogy is. Educators need to teach students how to use technologies smartly, strategically, and responsibly. Without actually allowing students to use digital media devices in learning environments, where else can teachers train their students regarding smart usage of technology? Why Did I Call My Facebook Live Show, Classroom Without Walls? In June 2017, I launched a weekly Facebook live show called, Classroom Without Walls — Using Technology to Reimagine Education. I created this show because I believe our society has changed a lot. Social media and technology play a huge role in our society. Technology has minimized the geographic barriers that once separated us; thus, has significantly amplified what one teacher can do in the classroom. I want to create a virtual community of people from all over the world, where we can be both teachers and students and learn from each other, and co-create content together. I also LOVE technology because it is helping reform the traditional hierarchical power-dynamic between teachers and students. In the digital space, there are no “forever” teachers or students. Instead, our roles have become fluid and blended. We are both students and teachers. There is always so much to learn and so much that we already know that we can share with the outside world. Technology has made such endeavors possible. So far, my weekly Facebook live show (every Wednesday at 5PM, EST) has been viewed by people from fifteen countries. And several of my videos have gained 1.2 K to 1.4K views with dozens of shares and hundreds of comments. Achieving this level of impact would be challenging through a traditional lecture class. Meanwhile, my show has created a virtual community people are both teachers and students. We come together every week to learn from each other and to allow others to learn from us. It has become a virtual classroom that is not confined by geographic barriers or physical walls, hence, #ClassroomWithoutWalls. I believe we each have a zone of genius. Many of us probably never have a chance to discover that. Instead, we get settled in life too soon. What success means to me is being in a state of creation, where we are operating within our zone of genius. In that state, work flows naturally to us. We become so focused that we forget about time and space. We become our work and our work becomes us. When we enter that state, regardless of what we do, creation happens effortlessly. And what we do aligns perfectly with our inspiration and the root of who we are. To me, that is success. My self-reinventing journey has just begun. There is a lot more to learn and to experience. I am excited to continue to grow myself and to explore future opportunities. I hope you enjoyed reading the highlights of my interview with Deirdre. Please listen to the entire episode and share it with friends who are on a similar journey and may benefit from my story. Please leave me a comment and let me know what you think about my self-reinvention.